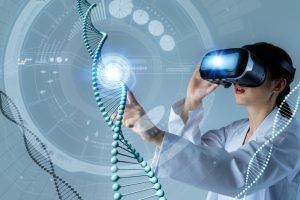 Researchers at the University of Oxford have developed a virtual reality software that allows them to visualize how certain genes are regulated . In your body, there are trillions of cells, all containing the same genetic code, which we call your DNA. You may be wondering, “Wait, if all of my cells contain the same genetic code, what differentiates a heart cell from a lung cell?” The answer is: gene expression. While different types of cells all share the same DNA, they express (turn “on”) only a certain subset of the genes in your genome, and ignore the rest. Genes that are expressed can lead to the creation of proteins, such as hormones and enzymes. In each of these cells, your long, stranded DNA is compressed by tightly coiling around itself. In this form, different regions of the DNA can fold onto each other, causing interactions that can turn genes “on” or “off”. The genes that a particular type of cell expresses can have a big impact on its function. Wait, What Is Virtual Reality? Do you remember going to the movies and being offered 3D glasses? Virtual reality (VR) is similar to that, but much more immersive. VR is an emerging technology that allows users to wear specialized headsets to interact with and experience an artificial sense of space. With VR, you can turn your head and see the world before you change, and use physical motion or a controller to interact with the objects that you see. Where Do These Ideas Intersect? As a collaborative effort between the University of Oxford, the Universita’ di Napoli, and the University of London, a new software package has been developed called CSyth [2, 3]. CSyth enables researchers to create new, interactive models by merging information from currently available sources of genomic sequencing, microscopy, and DNA interaction [2, 3]. The team aims to use the software to model the 3D interactions between different areas of the genome as it folds together to better understand how these interactions affect which genes are expressed . 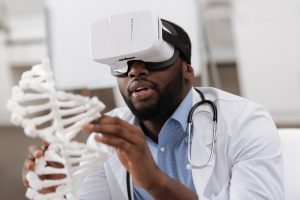 By using virtual reality, scientists now have an intuitive platform for discovering more about these complex interactions . This visually-stunning display allows scientists to take a section of neighboring genes that are stretched completely out on each end into a line, and then watch as the genes coil onto each other and interleave into a jumbled mass. In the future, the researchers believe that this newfound understanding may enable more advanced treatment of damaged cells, potentially alleviating the effects of certain types of human diseases . What other new, emerging technologies do you think could be applied to the field of genetics to spur discovery?